This description of the Plain Edition links the copying involved in the mechanical reproduction of printing to Stein’s iterative technique. As Stein wrote not long afterwards, “there is no such thing as repetition,” only “insistence.” The repetition of “Edition” functions both to insist on the importance of these “first Editions” and to stress that each edition is one among a series of copies open to potentially infinite duplication, as marked by the telescoping role of the repeated preposition “of.” Each instance of the words “Edition” and “of” is mechanically reproduced through the repetition of letters in the same font. Stein thus links the additive, insistent nature of language to the additive, insistent process of book production and reproduction. 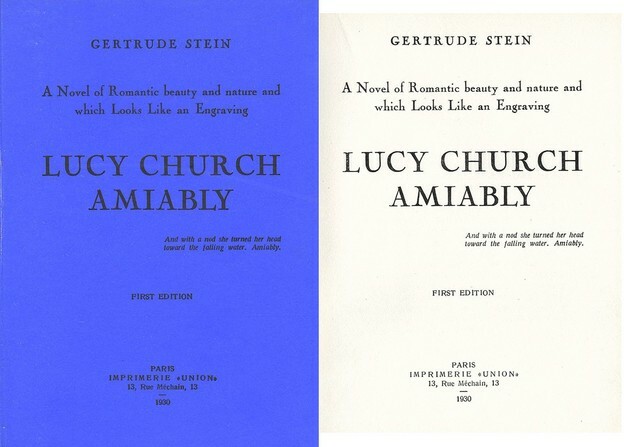 Stein also emphasized the poetics of the copy in the design of Lucy Church Amiably. As Sarah Stone has pointed out, Stein designed the book to look like the cheap blue copybooks in which she often drafted her work. Stein also described the book in the subtitle as looking “like an Engraving,” and, as Stone notes, punned on this idea by selecting the Cochin font for the book––a font named after the eighteenth-century engraver Charles-Nicolas Cochin. In this context, the exact repetition of the same printed text and layout on the blue cover and white title page also becomes more marked. All these decisions present the book as a site of reproduction, even as Stein’s writing itself stresses the reiterations of words and phrases. Nor is this an isolated example. Stein also clearly connects her use of language to the process of print reproduction in her famous seal with the circular “rose is a rose is a rose is a rose” design. Through this seal, Stein links the potentially infinite production of print copies to the potentially infinite repetitions of language.